A couple of weeks ago C and I got out on a trip in Skåne, near Söderåsen National Park. We stayed outside of the park though, to be able to camp freely. Söderåsen is a two hour drive from home, and we arrived around noon. Weather was great, and though there still wasn’t any leaves on the trees, it felt like spring was in the air. When we arrived at the parking lot, we met another couple that was going on a day hike. We started to hike down the trail, but they soon passed us, since we hiked in C:s pace. We came down the canyon, passed a stream and then continued up on the ridge on the opposite side of the canyon. When we reached the top we left the trail and hiked off-trail along the ridge instead. The forest was really beautiful, filled with really old deciduous trees. Even though we hiked on the ridge it was hilly. On one small valley the ground was pierced with rabbit holes and tunnels. It was interesting for both of us to find the different entrances and imagine what the vast network of tunnels beneath us looked like. The forest was also filled with lots of dead trees, with fungus growing on it. Camping is still more important to C than hiking, and after a couple of hours she wanted us to set up camp. We found a beautiful spot, where we had nice views, and somewhat close to water. Once again I’ve bought a new tent, in my never ending chase for the perfect shelter. Basically everything else in my gear is dialed down to be almost perfect for me, but when it comes to shelter I never seem to find the perfect balance between weight, size, comfort and the more subjective “homey” feeling. This trip was my first try of the Hilleberg Niak. Considered a 1,5 person tent, it’s aimed at solo travelers who wants a lot of space, someone bringing a dog, or a parent with a kid. At 1700g everything included it’s an acceptable weight for a gram geek like me, while offering a lot of protection from both weather and bugs. C was less than impressed though. All of fall and winter we’ve been camping with a big tipi and a wood stove to keep us warm. A small 2 person backpacking tent didn’t impress her. We made lunch, put up the hammock between two trees and just hung out. Below us in the canyon, a stream was flowing. I wanted to resupply our water, and in a valley next to our camp there was a way down the canyon that wasn’t as steep as on all the other places. Getting down to the stream was an adventure though. The ground was covered in slippery leaves, that also hid rocks and holes. After a slow and controlled descent we finally reached the stream and filled up on water. I was a bit worried about how we’d be able to get up again. But after a lot of work we managed to get back up to our camp. The rest of the afternoon was spend around camp and in the hammock. When it was time to go to bed we made dinner, brushed our teeth and crawled inside. It sure was more cramped than we where used to, but I think this will be a good backpacking tent for us. C had a restless night, and wanted to sleep on my sleeping pad. My sleeping pad is a narrow Exped Winterlite HL M. I can’t say it was a comfortable night, as it felt like she was trying to push me out of the tent. We woke up to bird song the next morning. C wanted to get up and play, but I preferred to stay in my quilt and continue sleeping. But you can’t really control a three year old who’s filled with energy, so it was time for me too to get up. But I did stay under the quilt when I boiled water for coffee and prepared the tortillas for breakfast. When we where done, we packed down camp. I wanted to hike some more, but C wanted to get back to the car. But I managed to persuade her that we would hike back on the opposite side of the canyon, instead of taking the shortest route back. We continued along the ridge to find a better route down to the canyon than the one we used to get water. When we came across a crest we startled a group of 30-something fallow deers in a valley. They run up the next hill, stopped to watch us, and then left over the next crest. It was an impressive sight, and they had been pretty close to us. We continued along the ridge, and when we reached the place where we had camped last year, we stumbled upon the herd of deers again. This time they didn’t see us, and we slowly sneaked closer to watch them. Eventually they saw us, and ran away across the ridge. When they had come pretty far from us they turned down on a trail leading to the canyon, and one by one they passed between the trees. It was like something from a Disney film. We took a closer trail down to the canyon. We then crossed the stream on a fallen log, and continued on a trail. We walked up to the opposite ridge and continued back towards the car. The trees where even larger on this side. The place felt magical. C was beginning to get tired on the last stretch, and wanted me to carry her at first. But with a little play and admiring the surroundings she continued to hike back to the car. It was a great trip, and I really love this place. I want to get back here soon again. A few weeks ago I took C with me to Stora Mosse National Park, about an hours drive north of Växjö. I’ve been here before, and last March I camped here. Stora Mosse is a large mire, the largest in southern Sweden, with dozens of km of footbridges across it. Spread out in the “mire-ocean” are several islands. Camping has been prohibited before, but since a couple of years back you’re able to camp on a few designated places in the park. The mire consists of a southern and northern part, cut in the middle by a road and a railroad. The previous times I’ve started at the northern end of the south section. But this time I wanted to see the northern section. I parked the car at the main entrance and we started to walk the trail around the lake there. We hiked for just a short while, until we stopped to make some coffee and hot coco. While we stopped I changed my mind, and decided that I wanted to go to the southern parts anyways, where there are more vast views. This time though, I would start at the southern tip of the mire instead. We drove to one of the southernmost entrances instead, and started to hike. After only a short while, we stopped at a bridge with benches to make lunch. The first part of the trail stretched through a pine forest, but after a while the trail turned and became footbridges that stretched some 6km north across the mire. C hiked on in a good pace, and even though she missed a couple of steps and put her foot down in the wet mire she was in good spirits. When we came to an intersection we turned west towards the “mainland”. We where going to hike a circle trail with an observation tower on a hill in the forest. Once back in the forest the trail went uphill. C preferred to ride on my shoulders in the uphills. On top of the hill there was a large observation tower, made for bird watching. We climbed the steep stairs to the top, and enjoyed the view. I’m a bit scared of heights. But when I told C that, and said that I wanted to go back down she replied that it was NOT scary. It was JUST exciting to be up there. So we stayed there for a while longer. When we got back down we hiked the rest of the loop to get back to the car. We had been out the entire day, but C still didn’t want to get back home. She was disappointed that we’d only gone on a day hike, and wanted us to camp there. I promised her that we’d camp the next time we got there. I really hadn’t planned to get out last weekend, and at first I didn’t really feel like it. But my wife needed to study and wanted the house to be a bit calmer, so she asked me if I wanted to take C on a camping trip. C was excited to get out in the woods again, since it’s been two months since she spent a night outdoors. I had decided to go to Tolgasjön again, to the “secret” spot that I had discovered a couple of weeks earlier. 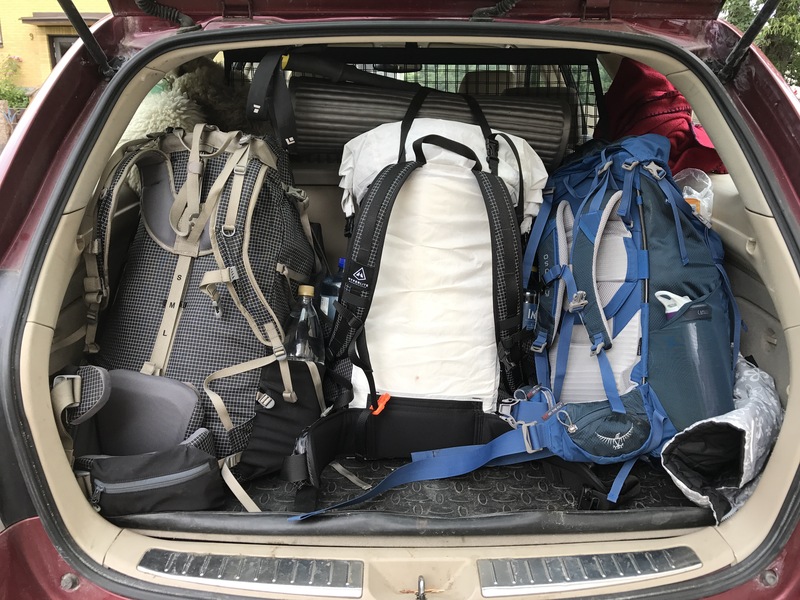 I packed up the car with a bag of firewood, my canvas tipi – the Tentipi Safir 5, a backpack with the sleeping gear and other stuff and my duffel bag with the stove and the cooking gear. I go all in on luxury on trips like these. We stopped by the store on the way and bought snacks and ingredients for our dinner. Then we set off toward the camp site. C fell asleep in the car, and I carried the gear out to the peninsula and set up the tent before I woke her up. When I was back at the car to get her two cars slowly passed us, and we waved to them. One of the cars had a brand name on them, and I think it might have been the land owner. I hope they don’t put up a gate at the beginning of the road but let us still have access to this place. When they had passed we walked out to the end of the peninsula together. C made herself comfortable inside the tipi while I chopped up some wood and made some feather sticks. We loaded the stove with fire wood and quickly got a hot fire going. Temperatures outside the tent was below freezing, but it didn’t take long for us to get sweaty, and we had to remove layer after layer. 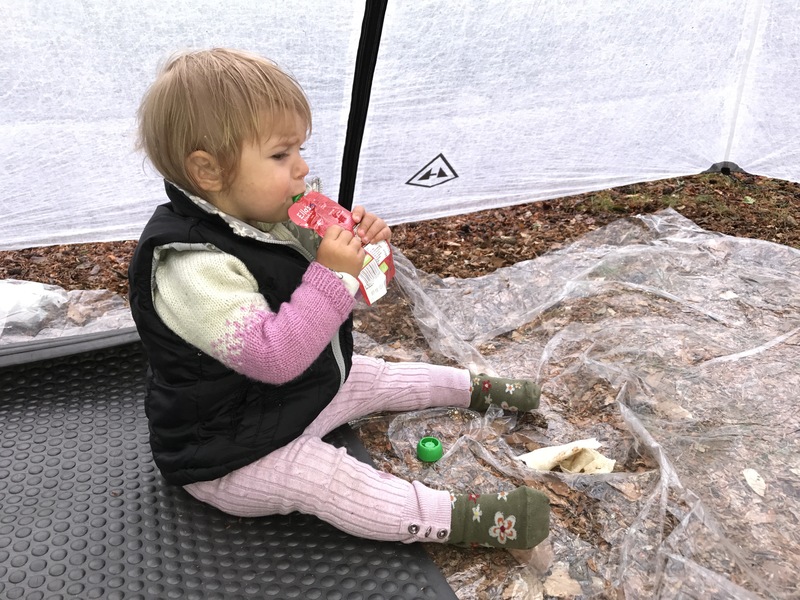 C barely wanted to leave the tent, but just wanted to stay inside the cozy warm tent, play and eat snacks. So that’s what we did for most of the afternoon and evening. When it was time for dinner I boiled potatoes in the pot and made reindeer stew in the frying pan. We ate it in flat bread rolls. This time I remembered to bring the lingonberry jam. It tasted delicious. The rest of the evening we just played and relaxed in the tent, before it was time for her to sleep. She fell asleep pretty quickly, and I spent a couple of hours reading and watching Netflix. I slept pretty good, and C just woke up once to go out to pee. I woke up a couple of time, and listened to the sound of snow falling on the tipi. The next morning C woke me up, and wanted us to get up and make some breakfast. I didn’t want to leave the warm sleeping bag, but I got up and quickly made a fire with the pre chopped small pieces of wood I had. The skies where covered in clouds at first, but after a breakfast of fried pita breads with cheese and salamis, we got out again. This time the sun had come out, and it was really beautiful outside. C didn’t want to get back home, and neither did I. The weather was perfect, with snow, sun and a couple of degrees below freezing. But we had other obligations so we had couldn’t stay too long. While we waited for the stove to cool down I packed up the rest of the gear. When the stove was cold enough we packed it down, packed down the tent and headed back home. Once again it had been a short overnighter, but a great time outside. I got one more week at work before I got four weeks of parental leave. I’m planning on spending a lot of the following weeks outside with my little rug rat. Spring has finally arrived in full force, and even here in this northern corner of Europe the trees are getting green. Next week there’s a holiday which leaves me with four days off from work. That means hiking time, and I’ll bring my two-year old on this trip too. I haven’t decided any details yet, but my plan is to quit a little earlier on Wednesday, pick Corinne up from Kindergarten and then drive to Skåne. We’ll then hike off-trail, set up camp somewhere in the forest and then spend Thursday exploring the area. We’ll spend one more night there, and then drive home on Friday morning. Like our last trip, we’ll mostly wing it, and just go where ever we feel like for the moment. I plan to use basically the same gear as last time, but use the Storminstove instead of the Trangia. I think it will be stable enough, and Corinne is calmer around the stove now than last year. I’ll bring better food this time. We had lots of snacks on our last trip, but used Knorr Snackpots for lunch and dinner. They weren’t a success, and I’ll bring home dried food this time instead. I’m thinking of trying some new recipes, like falafel with Ajvar or maybe a noodle recipe from Ultralight Dandy. I hope for nice weather and a great trip with Corinne. Last weekend I drove to Stora Mosse National Park for an overnight trip. I hadn’t planned to be out this weekend, but my wife had seen how stressed out I was from work lately (lots of co-workers have quit or gotten burn outs which leaves an ever increasing work load for us that are still there), and thought that I might need some hiking time to wind down. She knows the outdoors is the best way for me to reduce stress and recharge. Right up until the point where I sat down in the car it was still undecided where I should go. Stora Mosse National Park, Norra Kvill National Park or Raslången Eko Park was the places I had in mind. Eventually I decided to go to Stora Mosse, as I had only been there on a day hike before, and wanted to do an overnighter there. Stora Mosse National park is located just north west of Värnamo, about an hours drive from Växjö, and was formed in 1982. Almost the entire park consists of mire, and it’s the largest untouched mire in Sweden, south of Lappland. Together with Brokullen och Långö Mosse it’s almost 8000ha of protected land. There is a system of pine forest “islands” within the mire, and there are 40 km of hiking trails in the park. Some of them are possible to use with wheelchairs or a baby stroller, while other trails cross the mire on 30cm wide foot-bridges. If you want to leave the foot-bridges it’s possible to use snow-shoes to hike in the mire. From 2013 it’s also allowed to camp in certain areas in the park. Detailed maps can be found here. If you’re lucky you might spot one of the White-tailed eagles or Golden eagles living in the area. You get here by road 151 between Värnamo and Gnosjö, and the road cuts right through the park. In the middle of the park there is a visitors center, but be sure to check the opening hours before you get there. I drove up pretty early and arrived there a little before 11am. It was roughly a 1 hour drive from home. 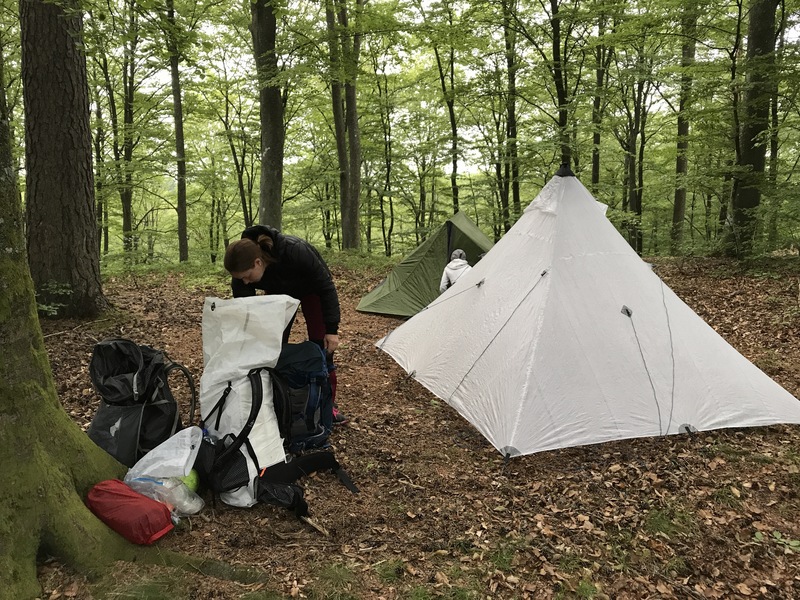 I decided to hike in the southern parts of the park, and had planned to camp near Lövö. The temps where slightly below freezing, and it had been cold and snowy for a few weeks. This meant that the mire was frozen over and I didn’t have to walk on the foot bridges. I did however follow the trail. There where ski tracks on the foot bridges and I walked beside them to not ruin the tracks. I worked up a good sweat while hiking in the deep snow. I turned right at the first intersection of the trail, which meant that I would be hiking through the forest instead of going through the mire. Hiking in the forest was effortless, compared to the sometimes knee deep snow in the mire. I hiked for about 1,5 hour before I stopped for lunch. It felt good to be out in the forest again, and I was really enjoying myself. After lunch I kept hiking south, but stopped once in a while, rolled out my cell foam sleeping mat and just laid down, watched the trees and enjoyed the silence. The forests here reminds me a bit of Tresticklan national park, with the old scattered pine trees. After a while the ski tracks stopped, and I kept hiking on the trail. There where no other foot prints, so I was alone in these parts of the park. After a while I passed the campground near Lövö on my left, but continued south to hike in a circle. I hiked the circle trail, past the hut at Lövö and then came back to the camp site from the other direction. It was only around 14.00 but I set up my camp anyways. It took a bit of effort to flatten out the deep snow, but eventually I got it flat enough to set up my tent. I inflated my sleeping mat, rolled out the sleeping bag and made cup of coffee. After that I decided to keep exploring the park. 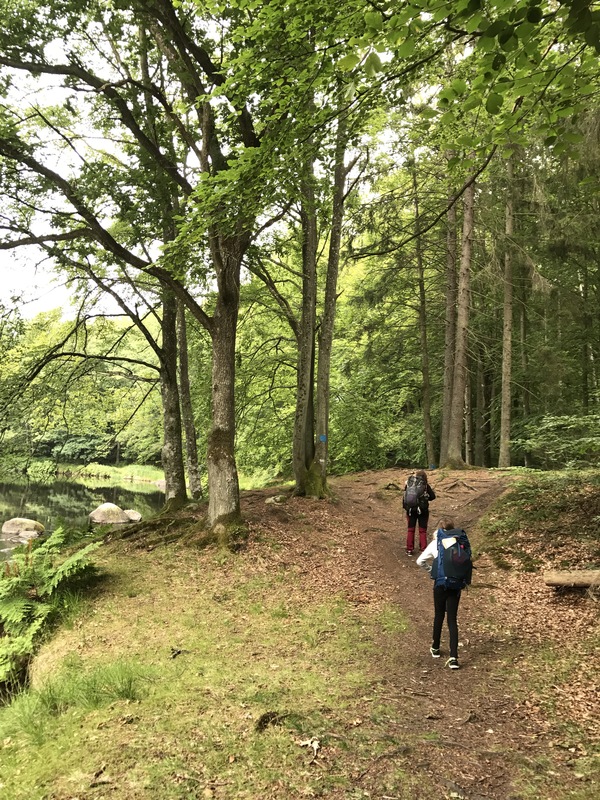 I went back to Lövö and hiked the trail towards Anderstorp. I came to an observation tower at the edge of a forest, and climbed up. For being in the middle of Småland, the views where amazing, and you could see for several km. I kept hiking south for a short while, but quickly lost track of the foot bridges. I turned back to my campsite and made dinner once I got back. I slept with the top vent and the door fully open, and had no condensation at all. I had a pretty good nights sleep, even though I toss and turn a lot. As usual, it took some mental effort to get out of the sleeping bag. I like winter, but now I’m really looking forward to the warmer seasons. I made a nice breakfast of chili Brie and salami in tortillas. It was delicious. After breakfast I packed up and left my camp site. I hiked back towards the car, but stopped once in a while to lay down on the sleeping mat, look at the tree tops waving in the wind and enjoy the last silence before I got back to the city. On the parking lot I met the first people since I left home on Saturday morning. A group of maybe 10 Danes where preparing for a day hike. As usual, I had a great time in the outdoors. I really like the simplicity of hiking life, the serenity of the silent empty forest and the monotony of hiking. My mind wanders as I move silently through the trees. It was a great trip, and I can’t wait to get back out on another trip soon. Sarek is a national park in Lapland, in northern Sweden, and is one of the oldest parks in Europe. It’s part of Laponia, which consists of 9400 sq/km of protected land, in the national parks Sarek, Stora Sjöfallet, Padjelanta and Stubba, as well as the nature reserves Stubba and Sjaunja. Sarek is a popular place to hike, but since there are no marked trails, nor any cabins it might not be the place for beginners. There are some bridges inside Sarek, but most streams and rivers has to be forded. I went on this hike together with my friend Fredrik, whom I hiked together with in Norway last year. We left Växjö on Saturday morning and drove up to Bollnäs, where we spent the night at his grand mothers place. We left there early on Sunday morning and drove the last ~1000km up to Sarek. We where planing to enter Sarek from the south, and use a free parking lot about 10km south of Kvikkjokk. We arrived at the parking lot at the bridge over Sitoälven, just before 20:00 on Sunday evening. There were many cars in the parking lot. Much more than we thought there would be. But this place seemed to be a popular starting ground. We parked and switched to our hiking clothes. The sign showed that it was 16 km to Aktse Mountain hut from the parking lot. We planned to hike just for a little while, and then set up the tents a bit from the parking lot, as soon as we found a good spot. 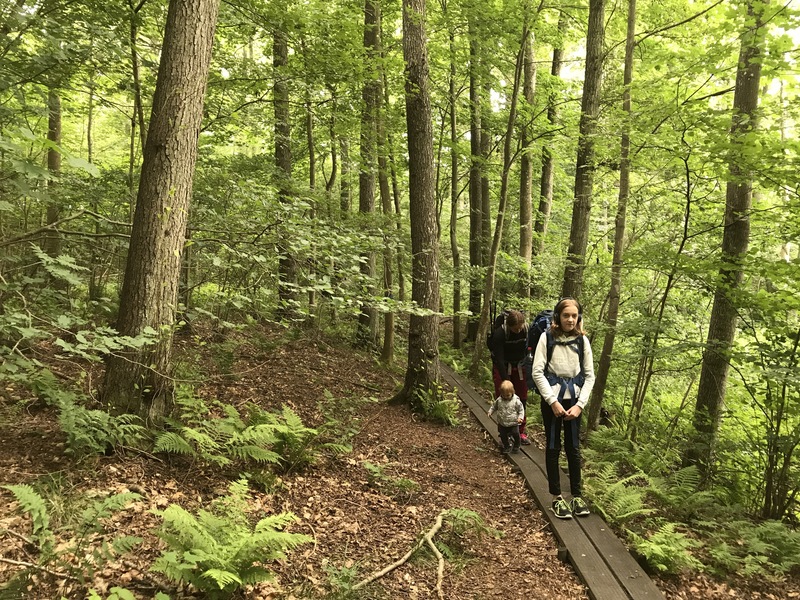 The forest was too dense to find anywhere to set up camp, and the mosquito swarmed around us as soon as we took a break, so we kept on walking at a fast pace. After a while we arrived at a small pier, where you could rent boat rides to Aktse Mountain hut. After the pier there was a bog. We were looking for the trail but did not find it. After a while we found the foot bridges through the bog, and saw that it was 6 km left to Aktse. The clock was now ~22.00. We decided to go on. However, it went much slower, and the trail went through dense forests and marshes. We found an descent place, but when I read the map, I thought we where only about 0.5km to the cottage and so we went on. It turned out to be 3km left instead, as I had miscalculated our position. We arrived at Aktse sometime between 24.00-01.00 at night and pitched our tents. We saw a sign that we should contact the hut warden, but since it was late, we decided not the wake up the warden, but do it the day after instead. The price to camp near the cabin was 200SEK. A woman came out from one of the nearest huts, looked at us and took a smoke. We wondered if it might be the hut warden, but since she didn’t contact us we thought that it probably was someone renting one of the STF cabins. We went to bed immediately after we had pitched our tents. I used my Sea to Summit nano bug net, but I wouldn’t have had to. My shelter did a good job keeping the mosquitoes out. I didn’t really like the bug net, and didn’t use it any more on the entire hike. As I’ve wrote in previous posts, my big trips this year was planned to be the Arctic Circle Trail between Kangerlussuak and Sisimiut in Greenland. I had really been looking forward to it, and basically everything was planned, except buying the plane tickets. The thing is though that I’m also going on a week-long hike with my childhood friend Fredrik, who hiked with me in Jotunheimen last year. Three weeks away from my family this summer was to much, and I decided to postpone the trip to Greenland. It actually felt like a hard choice to make as I was dead set on getting to Greenland, and my planning had to start from the beginning again. My wife has told me though that we’ll make sure I can go to Greenland next summer instead. I still wanted to go on a two-week hike, but Fredrik wanted to hike for a week at the most. To make this work, I had to come up with a route that would make it possible for me to start hiking a week in advance, meet up with Fredrik and then continue together. I also needed to make sure there were shortcuts to our meetup point if weather or my physique would keep me from reaching it in time. If I could make this work, I would still get the solitude I wanted the first week, and then a second week of hiking with a good friend. I started to look at Sarek, but I’ve never been there, and from answers in Swedens largest outdoor forum I came to the conclusion that it would be hard to put together a 1+1 week trip that didn’t include Fredrik flying out with a helicopter to a meetup point. I knew before even asking him that this wouldn’t be an option. I also felt that hiking for the first time Sarek, with no marked trails, shouldn’t be done with a timeschedule like that. Eventually I looked at Kungsleden, the Kings trail, and the possibility to meet up at Nikkaluokta and hike to Abisko together. My plan was to start south of Nikkaluokta about a week before Fredrik. The starting point had to close enough to reach Nikkaluokta in time even if the weather forced me to have a rest day or I would hike slower than I had planned. But I also wanted to be able to take a longer route if I hiked as fast, or faster than planned. After looking at the maps and searching for places to get to by bus I planned to start at Vakkotavare, in the lower left corner of the map. I would then follow the green line to Singistugorna. Here, I could turn east and hike to Nikkaluokta (the red line). This route should take approximately 3 day. But my initial plan is to keep following the green line until 2,5-3 km before Sälkastugorna. Here I’ll turn east along Gaskkasjohka. I could turn south again and take a shortcut to Kebnekaise mountainstation and then hike to Nikkaluokta (the orange line), keep hiking to Kaskavagge and there turn south to Kebnekasie mountainstation (the yellow line). But the plan is to hike around the mountain Palkastak and then hike south along Visttasvaggi until I reach Nikkaluokta (where the red and green line meets in the right part of the map). The planned route, following the green line, should take somewhere between 6-7 days. The rest of the hike, between Nikkaluokta and Abisko should take somewhere between 5-6 days. I have also done a few gear changes. A few very large gear changes. I did spontaneously bought the Exped Expedition 80 backpack, but I realized that I didn’t want to go the heavier route, but instead will try to fit two weeks worth of gear and food in my Exped Lightning 60 pack. If I come to the conclusion that I’ll need a bigger pack I’ll probably just go with the Hyperlite Mountain Gear 4400 Southwest instead. A sub-1kg 70l backpack. But I’ll do my best to get the gear to fit in my 60l backpack. I thought I’d use this summers trip to test it. Otherwise it would be easier to have just one weeks worth of food in the backpack and then post a food cache to Nikkaluokta and restock for the second week. We’ll see how I’ll do it. Anyways, I’m a bit embarrassed to write about it, but I sold the Expedition 80 pack without even using it. I don’t want do start using heavier gear again, and I think I’ll be fine using the Lightning. I also sold two old backpacks that haven’t been used for a long time, my Hilleberg Enan and my Luxe Outdoor Sil Hexpeak. I did get quite a lot of money for the gear I sold, especially the Hilleberg and the Exped pack, and I used the money to buy new gear. I’ve ordered a Hyperlite Mountain Gear Ultamid 2, polestraps and a Gossamer Gear polycro groundsheet from Backpackinglight.dk. They have great service, and if you order for more than 5000DKK you get at 10% discount on your order. I also ordered a Borah Gear cuben bivy with a sidezipper. With this setup my shelter, with polestraps, groundsheet, tent pegs and bivy will weigh ~900g. And it will be large enough to use with my wife or with two of my kids. Hopefully this will subdue my gear ADHD and I’ll stick with what I got.